After a long and regrettable detour, an Indian immigrant to America gets back on track with help from Srila Prabhupada and his movement. I was born in 1963 and raised in a pious middle-class family of six in Hyderabad. Being a boy and also the youngest had its advantages. I would do my own thing most of the time while my older siblings would labor with household chores. We celebrated festivals with much pomp and gathered with all our cousins to revel in the spirit of the occasion. As devotees of Sri Laksmi-Narasimhadeva, we visited Their beautiful temple regularly, and the priest knew our family well. Educating us in the concepts of karma and stories of Lord Visnu, Mom would teach us prayers, play harmonium, and sing devotional songs after we were done with homework. As Dad used to travel a lot, Mom raised us by herself. Apart from getting straight A’s at school, we were expected to succeed with a great career and find our place in the world. By the time I was sixteen, my dad’s hard work paid off and we moved to our own home in an elite suburban neighborhood. Most kids in the area were from rich families. They drank, smoked, ate meat, took drugs, and aped the Western lifestyle. That was considered hip and was the ticket to being accepted. So I started playing the guitar to be the coolest teenager in the neighborhood and embraced the norm. I went to college to study mathematics, physics, and chemistry. Jim Morrison and the Doors became my heroes do I need to say more about my lifestylen Through all this I somehow managed straight A’s and graduated college. I joined the travel industry, became a flight attendant, and moved to Mumbai. I was twenty-two, making great money by Indian standards, and had no one to hold me back. With access to lots of sensual pleasures and a ton of free time, I indulged in whatever pleased me and flew first class wherever I traveled. I was eating every kind of meat, drinking the world’s so-called best liquors, and smoking Marlboros (I had always liked the cowboys and horses in their advertisements). Going to late-night discos was part of the routine, as all the hotels we stayed at had them. Life seemed great. But I found out in a few years that the much-desired life of drinking, sleeping late, living luxuriously, and chasing sense gratification was giving me little or no pleasure. I had hit a saturation point, but I still did not know what would keep me happy, peaceful, and satisfied, nor did I know how to escape my bad habits. After a few years, the answer finally came to me. One day while I was bored in my fancy hotel room, I pulled out my bedside drawer and found a Bhagavad-gita inside. I recalled my dad’s words: “Why don’t you read the Bhagavad-gita instead of all these Western novels” So I took it out and started reading. But after a couple of pages, I was done. Nothing made sense. It must have been a bad translation, or maybe my senses were too contaminated. Probably both. In my early thirties, I found a sales job that took me to San Diego in 1996. I was a Type A and was so focused on my success that for several years I did not take a vacation and became the top national performer in the company. Success creates envy and enemies in the corporate world, and soon things were being taken away from me at every possible opportunity. To deal with the stress, I ran races, including a marathon and a half marathon, and practiced astanga-yoga, but I felt empty despite my success. Because of the pressures of the workplace, some nights I couldn’t sleep more than two hours. Fortunately, I found myself attending a series of lectures on the pastimes of Lord Krishna at an Indian temple. The stories I had heard in my childhood came back to me with a renewed perspective. I was taken by the message and the essence of these talks. They gave me a sense of peace, and I yearned for more of that nectar. On Janmastami (Krishna’s appearance day) that year, the priest asked me to play guitar along with other musicians while he sang songs (bhajanas). I started doing that at home as well. It felt really good and was a drug-free stress reliever. After a few weeks, I wandered into a used-book store one day to look for books on yoga and came across a copy of Srila Prabhupada’s Bhagavad-gita As It Is. For the first time I could understand enough to want to know more. Srila Prabhupada’s approach to the translation made it easy to digest. He explained the teachings at a level that someone like me, so deeply embedded in the Western culture, could understand. I felt that a turning point had come in my life. I understood why the pleasures derived from sense gratification, such as drinking, eating meat, and womanizing, not only do not give you lasting happiness, but actually create more problems in your life. To have lasting or increasing happiness, I discovered, I must engage my talents and senses in Krishna’s service. Soon I was craving to have my own set of the Srimad-Bhagavatam with Srila Prabhupada’s translation and commentary. I searched the Internet and discovered that I could get it at the San Diego ISKCON temple. Mahat-Tattva Dasa, now temple president, invited me to the Sunday feast at the temple and told me I could pick up my books that night. He even helped carry them to my car. Soon I was inspired to read Sri Caitanya Caritamrta. I did not miss a single Sunday feast for the next three years and am still a regular after five years in Krishna consciousness. I do not see this changing Sunday is now my best day of the week. Srila Prabhupada’s translations and commentaries were so enlightening and reassuring that they had a calming effect. The devotees’ recommendations to read his books, associate with devotees, and eat prasadam were easy to follow. I would wonder why the devotees did not have a program like the Sunday feast more than just once a week. Talking with more experienced devotees helped me understand the books better. Some of them were very eager to help me progress in Krishna consciousness, so I confided in them about my work issues and the personal challenges hindering my progress. One of them was so kind that we would talk on the phone some weeknights even though he was taking care of his ill mother. That helped me through some tough times. I noticed that there were many professionals and extremely intelligent and opulent people in the Hare Krishna movement but that their priorities were different from those of others. Their lives were centered on Krishna. I had never seen this before, especially in the West. Their enthusiasm was contagious. Soon I found that I just could not stay away from the temple. I started chanting one round a day on my beads, went to five, sixteen, and soon to twenty-one. Association with devotees, Sunday feast kirtanas, and Krishna prasadam put my life back where it needed to be. I was able to make many necessary changes to get away from a situation detrimental to my spiritual practice and my life. My goals became streamlined and crystal clear. I lost all passion for intense yoga asanas and did not need to run thirty-five miles a week. I realized that Krishna consciousness and the association of Krishna’s devotees can eliminate the need for such intense bodily fixes, a need so common in the West. I would often hear my American friends mention their therapist as if it is a necessary part of life for everyone to see a psychiatrist regularly. I wished they would read Srila Prabhupada’s books. I noticed that my mental cobwebs gradually started clearing out. I became a total vegetarian once again, got rid of my wine collection, and even gave up drinking caffeine. It was amazing to see the shift in perspective and priorities. I realized that just keeping fit, eating healthy, and avoiding alcohol did not mean much until it was all dovetailed in Krishna consciousness. That is the real catalyst to a successful formula. A lot of the fears and issues that had plagued me suddenly seemed baseless. For instance, lately the fact that I am not married although I am in my forties does not bother me. I feel absolutely fine leaving it up to Krishna to steer my life in the direction He feels is best for me. My typical day now starts with arati, chanting sixteen rounds, and reading Bhagavad-gita As It Is. I read the Bhagavatam at night and chant another five rounds before going to bed. If only I had found Prabhupada’s books earlier! I often regret that, and I apologize to Krishna for all the time I wasted in my younger years and for misusing my independence. I missed many opportunities to visit Vrindavan when I used to fly into New Delhi each month. Having lived in Mumbai for eleven years, I never once visited the large ISKCON temple there. I wonder how my life would have been if I had taken to Krishna consciousness sooner. But I also understand that I was not ready then and that I am ready now. The one positive thing was that as a flight attendant I served groups of devotees on our flights between India and Germany, often devotees traveling to and from the USA. 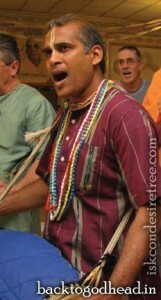 By the mercy of Krishna and His devotees, in April 2009 I released my debut CD of Krishna songs. I played all the instruments and sang the lead and the backup. Five of the tracks were written by fifteenthand sixteenth-century saints who were exceptional devotees of Krishna, so it is a tribute to their work. I also feel that because my parents were followers of Lord Visnu and because hearing Krishna’s glories was a part of my childhood, He protected me through all my bad decisions. He made sure I did not do anything drastic or lose my life even though I indulged in much sense gratification. For instance, I was on two flights where we had engine fires in mid-air. In one of them I was sitting facing the engine, which blew up right in front of me. Some of my colleagues were on an attempted hijacking that lasted eighteen hours. One of them was fatally shot. I was on the flight just prior to that and hence safe in my hotel room when I heard the news. I know there is no reason other than Krishna’s mercy for me to be where I am today. Life is so fragile that it can end at any moment. The philosophy of Krishna consciousness will help you come to terms with that reality in such a way that the fear of leaving this body bothers you less and less. You come to understand that this world is not your real home. And you might as well remember that you will be forced to get out of your surroundings. So, make sure that your plans and activities are taking you in the right direction. I am grateful to my parents for the spiritual foundation they gave me. As Krishna says in the Bhagavad-gita (2.40), a little effort on this path can deliver one from the greatest of fears. And it never goes to waste. If my former comrades were to see me today they would probably pass out from shock. I would invite them to the Sunday feast and gladly serve them Krishna prasadam a great way to introduce them to Krishna consciousness. Jaya Srila Prabhupada, the founder and life of ISKCON! Thank you for helping me realize the futility of material life and for putting me on the path back home. While I have a long way to go, I find peace in the fact that I have started my walk back, one step at a time.